The Monastery of Perpetual Adoration in San Francisco was established under the leadership of Mother María Gertrudis del Sagrado Corazón, who moved the community from Guadalajara to the United States in order to escape the persecution of the Church which was taking place under President Calles. Mother Gertrudis was born Ana María Barrosso Flores Alatorre on June 5th, 1879. Known as Anita in her youth, she was the sixth and last child—and the only daughter—born to devout Catholic parents. Only Anita and two brothers—one three years older, the other ten years older—survived past early childhood, and these three children suffered the death of their father when Anita was only six months old. In 1888, Anita and her mother and brothers moved into a house in La Villa (Mexico City) occupied by Sisters of Perpetual Adoration and began serving as assistants to the Community. From then on, Anita was surrounded by the Sisters, who prepared her for her first communion at the age of nine and began teaching her as a student in their school when she was eleven. As Anita passed into her teens, many young men sought to court her, but on October 17th 1896, at the age of seventeen, she became a postulant with the Sisters who had been her teachers. Two months later, she took the religious name Sister María Gertrudis del Sagrado Corazón when she became a novice. On May 29th 1898, Sister Gertrudis took her vows of poverty, chastity, and obedience. Tall and slender, Sister Gertrudis is described by Sisters who lived with her as having a profound and penetrating gaze, a sharp mind, an excellent memory, and a kind and caring personality. Although she suffered from chronic ill health beginning in her teens, she was regarded as an extraordinarily hardworking and pious Sister who served as a role model for others. In fact, just two years after professing her vows, she was elected as Mother Vicar, a position which allowed her to further develop the outstanding leadership qualities for which she later became known. 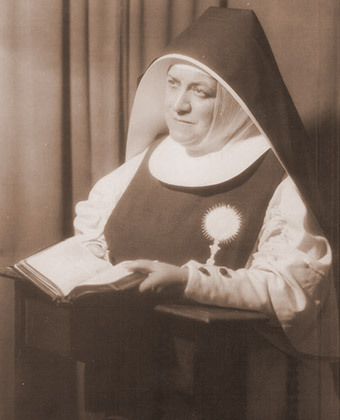 In December 1902, The Archbishop of Guadalajara asked the Mother Superior of the community in La Villa to establish a new foundation of adorers in his archdiocese. Mother Gertrudis was elected as Superior of this newly planned community, which was established in September 1903. From this point on, Mother Gertrudis was repeatedly elected Superior, almost without interruption for the rest of her life. As Superior, she was greatly loved and revered and was known for her maternal tenderness towards her Sisters and her intuitive understanding of their needs and feelings. Mother Gertrudis successfully guided the Guadalajara community through the difficult years of persecution by the Mexican government and eventually assured its survival by relocating it to San Francisco, California in 1928. She died in San Francisco on February 13th, 1937.